Juicy bits of info about the two companies that you might not have known! 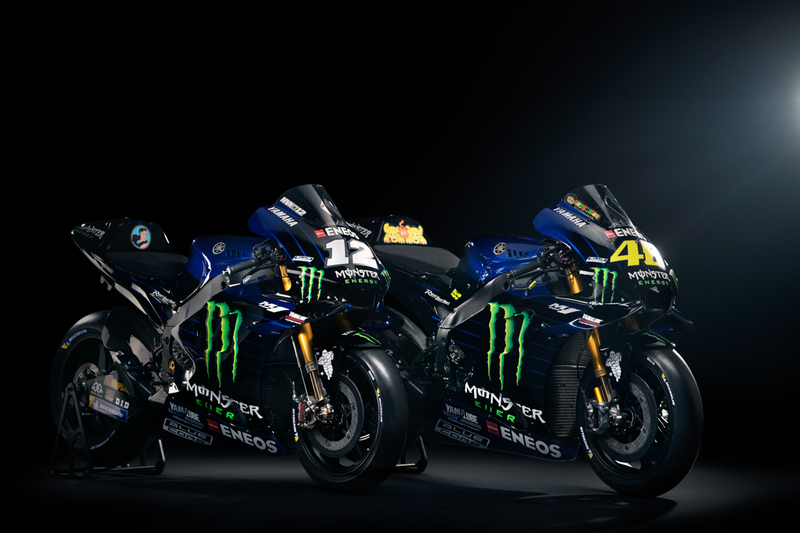 The alliance has been present in MotoGP for some time and the formation of the Monster Energy Yamaha MotoGP team has some cool and curious information behind it. Delve into 10 facts that might not have passed through a race fans’ radar! 1) 2019 will be the eleventh year that Monster Energy will be present on the fairing of a Yamaha MotoGP machine. The link started with the Tech 3 team and James Toseland and Colin Edwards were the first riders. Team Principal Herve Poncharal claims that the black Tech 3 M1s were voted ‘Best Looking bike’ by a prominent magazine on more than one occasion. 2) Monster Energy first teamed up with Yamaha back in 2008…but it was not in MotoGP. David Philippaerts became Italy’s first ever FIM World Champion in the premier class of MXGP with a thrilling success in the very last round of the ’08 motocross season. The black and green Yamaha YZ450F was hoisted onto the top of the podium with the #1 plate. Since then the relationship has blossomed and the Monster Energy claw can be found on Yamaha machinery in disciplines like Supercross, MXGP, Endurance racing, European Championship and of course the pinnacle of MotoGP. 3) The factory Monster Energy Yamaha YZR-M1s are full prototype motorcycles: the peak of two-wheeled racing engineering. The bikes are capable of over 360kmph (nearly 230mph) thanks to 240 horsepower and 157kg (346lbs). The bikes are priceless because of the specific and advanced technology but expect to pay 1.5million euros (1.7 million dollars) for a year-old model! 4) This season Valentino Rossi should reach his 300th race in MotoGP and 400th in all classes. He has been part of the grand prix paddock since 1996 and has only missed 4 races in that 23 year spell. 2019 is Rossi’s 14th year with Yamaha and seventh in a row since he ‘went blue’ once again in 2013. 5) Rossi will celebrate his 40th birthday on February 16th. For ten of those forty years ‘The Doctor’ has been a Monster Energy athlete. He has his own signature drink and was the subject of special five-episode video series in 2016. 6) Currently Maverick Viñales boasts the most wins from the pair as a Monster Energy Yamaha double-act with four successes (and that thrilling victory in Australia last autumn). He finished third in the world in his maiden season on the M1. He will run the #12 in Grand Prix for the very first time, having used #25 since his debut as a teenager in 2011. 7) Viñales is a former world champion. At the age of 18 he won the 2013 Moto3 FIM title by two tenths of a second on the final lap of the last race against current rival Alex Rins. Hailing from the Costa Brava town of Roses, Viñales was a teenage revelation: winning on just his fourth Grand Prix appearance. The site? The Monster Energy Grand Prix de France. 8) 2019 represents 20 years for Lin Jarvis overseeing the Yamaha Motor Racing operation in MotoGP (which is based a short distance from the Monza race circuit in Italy and has been located in the country since 2005). In that time Yamaha have owned 7 Riders’ titles and 6 Constructors Championships; earning the Triple Crown (Rider, Constructor, Team) for three years in a row from 2008-2010. From 1999 and the latest incarnation of the factory team Yamaha have run 3 Spaniards, 3 Italians and 2 Americans. 9) Monster Energy Yamaha MotoGP employs around 20 staff at their Italian site but the crew grows substantially at MotoGP events, almost doubling in size with all the technical, mechanical and hospitality personnel joining the operation at circuits. Each rider has 8 mechanics or technicians in their pit box. 10) What number has Valentino Rossi used his whole career and since his Grand Prix debut on a 125cc machine in Malaysia in 1996? Yep, #46. Reverse those digits and you have the number of years Yamaha have been present in the FIM World Championship in 2019.